The Credit People has been providing professional credit repair services since 2001 and holds industry accreditations, including an A+ from the BBB. They offer a wide range of removable items, updates in real time, and a 60-day 100% money back guarantee. Since its founding in 2001, The Credit People has assisted over 200,000 people in correcting unverifiable and inaccurate items on their credit reports. In that time, The Credit People have successfully removed almost 1.5 million negative credit items for their customers. The Credit People's experts inspect credit reports from all three bureaus (TransUnion, Equifax, and Experian) to search for erroneous items and file unlimited disputes on your behalf as part of their Score-Driven Results® strategy. Unlike many credit repair services, The Credit People provides your initial credit report and scores for free (very rare in the industry). From there, a majority of The Credit People's customers see positive credit results within the first 45-60 days (although every situation and timeframe is unique). Credit check-up and repair can be a very time-consuming and complicated process, and The Credit People takes that work off of your hands. Within 48 hours of signing up, The Credit People will send you the login info to access your personal TCP account dashboard where you can monitor all activity conducted on your behalf. Exclusive discount code only for TheCreditReview readers: Mention promo code TheCreditReview when signing up to receive a $10 discount every month (from $79/month to $69/month) on TheCreditPeople's top rated credit restoration services. Very low first work fee: The Credit People only charges $19 for their first setup fee. Other competitors in the credit repair industry charge $59 to upwards of $195. 60-day 100% money back guarantee: If you are not satisfied with the service, The Credit People offers a 60-day money back guarantee. Industry accreditations: The Credit People is accredited by the BBB (Better Business Bureau) with an A+ and certified FCRA (Fair Credit Reporting Act). Strong credit repair team: Having processed over 310,000 unique credit reports, this team is your front line when it comes to disputes, letters, and creditors. They are certified and trained in various laws governing credit repair and continue training in recent laws, statutes, and credit reporting practices. Customized credit analysis team: No two credit reports are created equal. What affects your credit score and how it improves, requires special and customized attention. Understanding debt to income ratio, credit type ratio, scoring models, and of course, credit history, is key. This is what The Credit People's Score-Driven Results® are all about. Updates in real time: A mobile app and customizable text alerts allow you to view any credit repair updates and progress made in real time. Updated credit reports are provided on a monthly basis while updated credit scores are provided every 90 days. Wide range of removable items: Bankruptcy, student loans, late payments, liens, repossessions, hard inquiries, paid collections, judgments, charge-offs, inquiry validation, and debt validation can all be removed from your credit report. Additionally, they provide unlimited disputes. Fast, legal, and effective credit repair: Although each individual case varies, many customers saw results within 45 to 60 days. 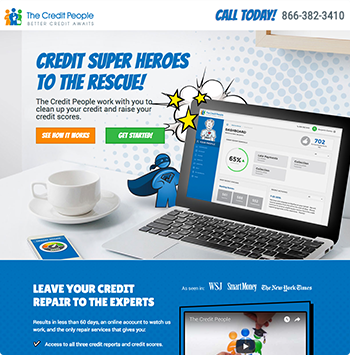 Available in 49 states: The Credit People serves the whole country (with the exception of Oregon). Pay as you go: There is no fee for canceling, so you can pay as you go. 24/7 availability: Assistance is available at all times by a toll-free number or email. The Credit People has not been in business as long as many of their competitors. They only provide one monthly payment option rather than a pay-per-deletion method. The Credit People holds several accreditations, including an A+ from the BBB and an FCRA certification. They are also one of the few companies that offer a satisfaction guarantee with a 60-day 100% money back guarantee. In order to keep you updated 24/7, they have a mobile app and text alerts. They are also one of the few companies that provide updated credit reports monthly and updated credit scores every 90 days. The Credit People offers one package that covers all services. After a free initial consultation, The Credit People charges a setup fee of just $19 for the first 7 days. If you wish to continue, they normally charge a monthly fee of $79. However, we've secured an exclusive discount only for our readers (mention discount code TheCreditReview and receive $10 off every month of service, bringing the price down to $69/monthly). How does The Credit People compare to its competitors? The Credit People provides initial credit reports and scores for free, along with 24/7 assistance by phone or email. In case you are not satisfied with their service, The Credit People also offers a 60-day 100% money back guarantee. Their initial setup cost of $19 is lower than most competitors, which typically ranges from $59-$199. Their monthly fee of $89 ($79 with exclusive discount code TheCreditReview) is also relatively low compared to other credit repair companies. How does The Credit People work to improve my credit? After a free consultation which also comes with your current credit report and scores, you pay a setup fee of $19 that will get you started with an online account. From there, you will be able to see your detailed breakdown of your three credit scores, and The Credit People will start challenging and removing questionable items from your credit. The Credit People will continue this process month-to-month until they've accomplished the best results for you, and you have the option to cancel at any time. Most of The Credit People's customers see improvements within the first 45-60 days (although every situation and timeframe is unique). The Credit Repair Organizations Act (CROA) sets tough laws to ensure company compliance and protect consumer rights. For example, the CROA states that no credit repair organization can bill a customer until services are performed. However, many companies charge a “first work fee” in order to acquire credit reports. A for-profit company must also accurately inform you of what they can and cannot do in addition to providing a written contract and allowing the contract to be canceled within three business days of signing. If you ask, a legitimate company will inform you that you have the right to fix your own credit. Companies that guarantee to erase bad credit or raise your credit score by a high amount very quickly is a red flag. Because The Credit People follows all of these guidelines, they are a trusted credit repair service. Because of the CROA, no credit repair company can guarantee the removal of bad credit. The Credit People does offer a discount if you decide to sign up your spouse after you complete your order or up to three days following the order. Both you and your spouse will receive $20 off each of your first payments. This discount is only applicable to the monthly payment plan and not available for flat-fee pricing.